Virtual Actors replace Humans in Hollywood? If you run a movie studio and run short of money to hire a hot shot actor for a couple of million dollars, you can always have a few cartoonists draw in a funny character and you'll get something like "Who framed Roger Rabbit"
If you've got some extra bucks to throw in, you can use several advanced techniques to create stunning special effects and you get Terminator III", or "Lord of the Rings""and every one gets wowy and throws in a few Oscars. In short, the business has come a long way since the cheap B-movies of the 80's dealing with virtual reality. But is the industry ready for a next leap? The technology to pull it of is in our hands now. Until now this technology looked cheesy. But no longer. 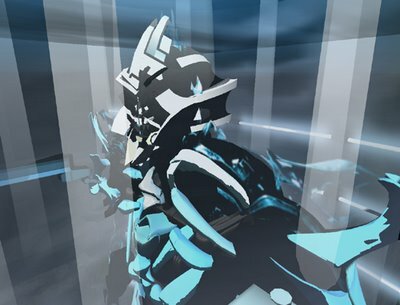 You probably have already seen virtual actors in movies and haven’t realized it (all done with Light Stage). 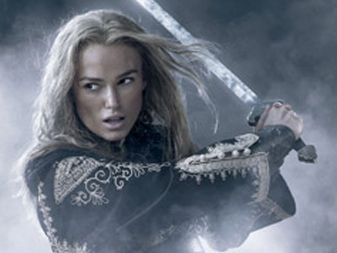 Here’s the two videos so you can see how movies are changing. Charlie Boswell, who has the coolest job at AMD, working with movie studios to make special effects where he talks to me about what he’s working on and tells me about Light Stage. If you are into movies, he talks to me about a bunch of movie houses and how they are using technology. Jules Orbach, CEO of Light Stage/OTOY, showing me some clips of what these virtual actors can do. He was also up on stage during the AMD keynote and Barron’s Online has a live blog of that. On stage AMD and OTOY announced they were working on the fastest supercomputer ever. Anyway, it’s interesting to see how technology continues to change our movies. Boswell blows my mind when he says this technology will soon be affordable for everyone (soon being years, not decades). Are we ready? Yes, but it needs to be a way lot better then the Second Life adventures of CSI for instance. Are we ready? Well, we're constantly being fooled by Hollywood so what's the big difference? If we take this step it's a bit like "S1m0ne" come true, the film with Al Pacino who fools the world with a virtual actress, or on the darker side a Robert DeNiro movie "Wag the Dog" where he also plays a Hollywood director staging a fake war to help the president get reelected. Are we ready? Yes we're gonna take it hook line and sinker. We even get fooled with virtual actors in virtual worlds! 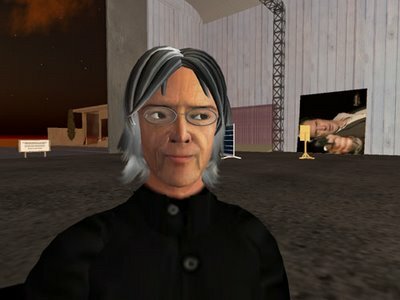 In april 2007 world famous Director Paul Verhoeven held virtual auditions inside Second Life for his movie Zwartboek II. Afterwards I did an 'exclusive interview' with this tech savvy Director who was of the opinion that Virtual Worlds would certainly have added value to Moviemaking. Nothing to do with the metaverse or the forseeable future, but still one I'm looking forward too. Just when I was about to switch off my pc and go to bed, an email came in which I'd like to share. 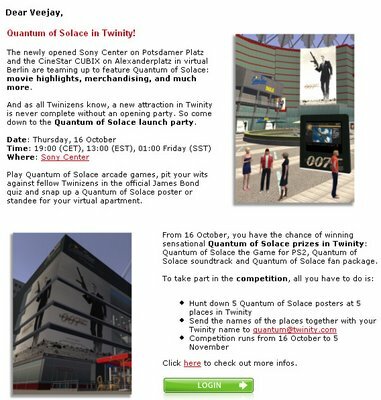 It's a mailing by Twinity on a promotional action for the latest James Bond movie. Go check it out at Twinity. Today no Second Life for me, but for the first time in ages another night on the couch watching a movie. 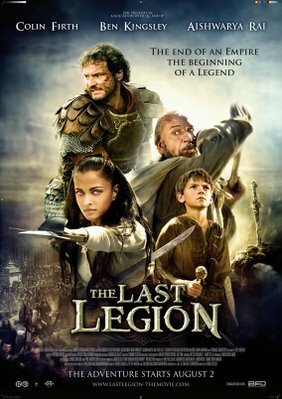 This time it was The Last Legion, a motion picture about the Goths invading Rome and the child emperor fleeing to Brittanica, seeking the Last Legion; the 9th, stationed at Hadrian's Wall. It was not a historical accurate movie, but a very entertaining prequel to the Arthur Saga. Probably the most entertaining part to watch was the Indian warrior, Mira (Aishwarya Rai)... Sorry, can't help it. It's saturday night. 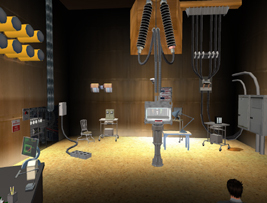 Just a few days ago we were all watching the grid with great anticipation to see what would be the outcome of the first CSI:NY goes Second Life show. 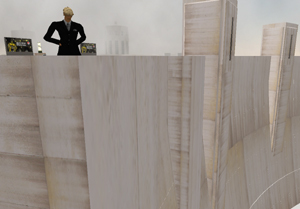 There's many blogs out that that voice an opinion, but I'd pick out Ambling in Second Life over almost any other blog. As the hubbub starts to subside on the whole CSI:NY thing, I thought I would record some of the stuff that’s been rattling around in my head over the last few days. So… a major leap in convergent media – and good exposure for Linden Lab.What could possibly go wrong? The big risk we all knew about was grid overload, but so far (touch wood) this has not happened, in part because the invasion of newcomers simply has not happened on anything like the anticipated scale. platform. A role for which it is particularly inappropriate – and for which CSI has no need, since such platforms exist already. Now, I’m not trying to be precious about SL here. 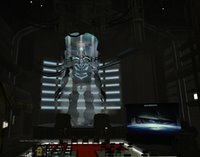 In the whole wide metaverse there is clearly a large need for entertainment and, indeed, for gaming. 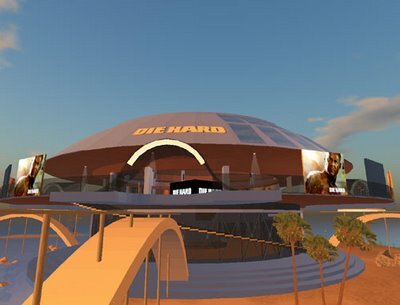 But to be blunt, Second Life cannot offer the level of gameplay that seasoned gamers have good reason to expect. 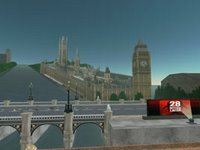 “good exposure for Second Life”. The second lie is that Second Life is a sleazy game, populated by players. This lie was not necessary to the plot, and is the one with which I have the single biggest issue. Again, how this view of Second Life can be viewed as “good exposure” I am at a loss to explain. This might also explain the less-than-impressive uptake of new accounts. On a lighter note – I was tempted to call this piece: CISCO:NY. As I have mentioned previously, the grossly over-the-top “Ciscofication” was – to me at least – a complete turn-off. I think Linden Lab have done themselves no favours here. It is not true that “all publicity is good publicity.” I am dismayed at the short-termism shown by Linden in going along with this farrago. 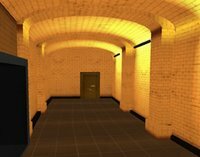 Also, in handing over the source of the viewer to Electric Sheep we have the interesting situation where the open source code has been re-skinned, a few neat, new features added, and the whole thing seemingly locked up again as a proprietary product. Well that’s what I think. So what did I get wrong? hours I watched them before, during, and after the CSINY show, couldn't have beat 5,000 concomittant, and no more than 20,000 max total arrivals. In fact, it's probably far lower." For exact numbers we either have to wait for CSI or the Electric Sheep Company to come with traffic stats and onRez viewer downloads and compare them to next weeks' Headcount by Tareru Nino. I do believe though that the average number of concurrent logins is higher these days. I'm not saying it was a smashing success. The massive number of islands, the fuzz upfront made us expect a lot. Again, too early to tell. There may well be ROI's made, but not sure which. I hope it'll continue though. Haven't had time to start solving the murder yet, but I for one like the concept. Me liking something isn't a guarantee that it'll make you millions though. Yesterday I shortly blogged on the new Electric Sheep Company project. 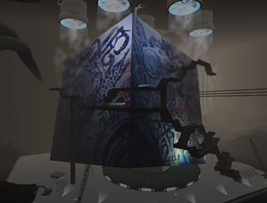 Today the Second Life Insider blogged this to. The project involves a collaboration with CSI, the world's number one television show. One of the keynote speakers of the Virtual World Conference was Anothony Zuiker, creator of CSI who told us more on the project. On october 24th CSI New York will submerge into Second Life, with Gary Senise chasing the murder suspect into Second Life. This airing will get Second Life into the homes of 16 million viewers. This broadcast will get a follow up on february 6th 2008. It calls for action, you can join the CSI team and solve the crime. Zuiker sees virtual worlds as the next level of entertainment which will be cross platform in the future. "After 9/11 the world changed. Insecure teenagers started looking for communitieds and businesses started to think cross platform," he said. 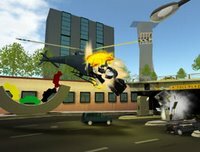 This cross platform operation started for CSI with viewer interaction by using cell-phones, now it will get multi-platform with Second Life stuff, inworld gaming and blogging. There will be a regular Murder of the Month blogpost by Anthony and you have to finish it.This will put on heavy strain on Second Life, calling for performance on the 24th. Let's wait and find out what the limit of concurrent log-ons will be. 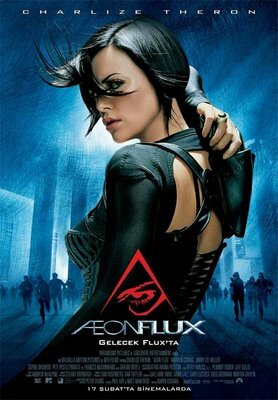 Yesterday, after finishing Neuromancer I had to blow of some steam and watched the Æon Flux dvd with Mrs. V.
The plot is very basic; The world is destroyed (in 2011) and only 1% of humanity survives in the city of Bregna. The city is being led by the Goodchild dynasty for 400 years and it's about 2400 when the people of Bregna start to revolt. At least, a small group called the Monicans. Aeon is sent on a mission to kill dr. Trevor Goodkind and they fall in love, and save the world. Well, actually, there's a bit more to it (but don't wanna put up the spoilers), making it a good watch after all. Early june I reported that there weren't enough bots in Second Life as it is. 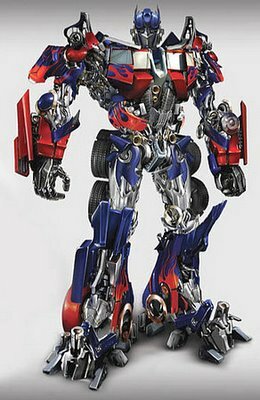 After the copybots and landbots Hollywood thinks it's time Second Life sees the Autobots and Decepticons coming. Hollywood kindly asked me to hold my thoughts for a while, but now it's an official release. 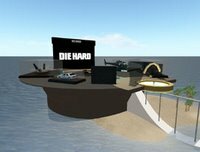 The moviepromo is build by Silverscreen (who are also responsible for Die Hard 4 and a few other goodies) and is build in the sim Sector 7. It's an enormous build and they had less than 400 prims left when they'd finished. 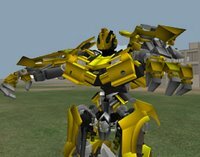 The first pic is a Bumblebee avatar, though contrary to the original series it ain't a beetle, but it's a real American Chevy (must be a sponsor thingy). The second one is Megatron captured in the deeps of this huge build. The build is actually a sort of double-decker sandwhich with dark sci-fi autobot HQ looks at the bottom with lots of tunnels, (press) rooms and such. 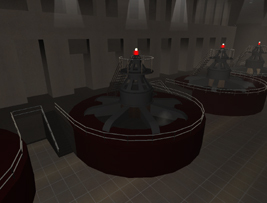 The top level is the more cityscaped area with a huge dam - a centerpoint in the upcoming movie. 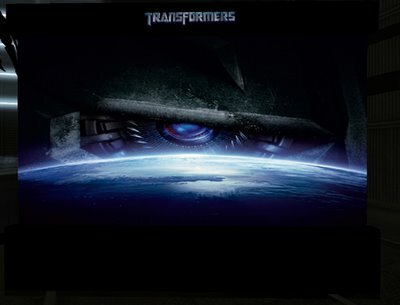 "I'm not much of an action fan, but Transformers is a throwback to my childhood, so it's a must see for me. When the time came, Maxwell Lisle appeared to moderate the event and the journey began. First up were Michael Bay, executive producer of the film, and Lorenzo di Bonaventura, producer. After that, some of the cast members were interviewed, including Shia LaBeouf, Megan Fox, Josh Duhamel, and Tyrese Gibson. The film premieres on July 2nd, so don't miss it!" Last week we saw Bruce Willis (in some blogs said to be Yippie Kay Ay, or others as Bee Dub) come to Second Life to promote his new movie, Die Hard 4 (blogged here). 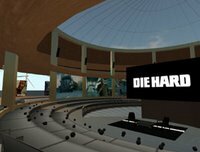 Hollywood now has a turn on on Second Life and has decided that Second Life needs more bots. 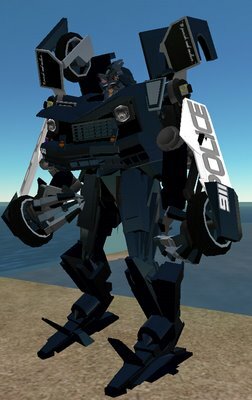 After copybots and landbots and tons of other not so nice spiderthings Second Life is heading for the Autobots and Decepticons as Silverscreen is prepping the SL entrance of the Transformers movie. It seems I was a little ahead of the official press. I've been kindly asked to hold down on this post for a while. Last night saw the opening of Bruce Willis' Die Hard 4 representation in Second Life. When I got home it was quite late and decided to take a look, but couldn't get in. The sim was filled to the brim with 58 residents present for the opening, so I decided to take a raincheck. 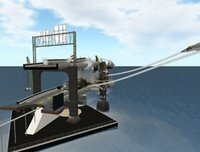 I would expect this build to be done by one of the big content creators, like ESC or MoU, but it's build by the V3 group, who also owns and operates Sillicon Island and were the producers of the International Technology Expo of 2007 event. 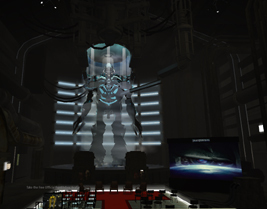 The sim has a nice feel to it, set up from a central dome with auditorium and infostands bridges lead to four platforms displaying props and scenes from the movies. According to Liam Kanno from the V3 group, Bruce Willis was about an hour late for the opening, but hung around for nearly an hour as well to chat with the visitors. 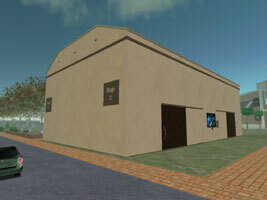 Well, today no blog on Second Life. Sometimes it's time to enjoy Real Life as well. Tonight was a night on the town with Mrs. V. Pirates of the Caribbean III was certainly a good laugh. Triggered by the audition series I blogged about yesterday, I went in and had a quick look. Various virtual actors and actresses came by to perform a scene from the movie. After the first night of the auditions I had an exclusive interview with Paul Verhoeven, one of Hollywoods great directors. VeeJay: This SL gig is about promoting your movie Blackbook? VeeJay: Don't you think using the Drop Zone will make it an exclusively Dutch event? How about promoting the movie in other countries? VeeJay: only for the Netherlands? VeeJay: Did you enjoy your first virtual auditions? VeeJay: more seriously than you yourself? VeeJay: With movies Like Total Recall and Robocop, you’ve probably got a long record with computer animation. What makes Second Life different? VeeJay: I can imagine, perhaps the same will count for making first draft versions of movie sets? 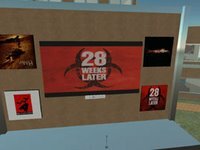 VeeJay: have you got any plans to use Second Life more often for promotions and auditions like this? VeeJay: okay, one last for the sake of the community, did you like working with the guys from Lost in the Magic Forest? I know Dobre has got some movie experience. Did it show in their professionalism? Fox Atomic has transferred the stereotype hollywood moviestudio into the Metaverse. 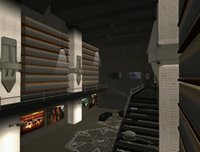 Though the Holleywood studios in Real Life (meatspace) are a sight to see, I must admit the lone studio in typical bunker style on this sim doesn't transfer the same feeling. A small ticket area looks nice, but misses context as well. The sim is mainly used for streaming movietrailers and setting up decorums of their new series. The 28 weeks later decor of the houses of parliament is a nice trick, but Fox has done little effort to create an innovative experience.